← Searching – 60’s? 70’s? Tiny BABY DOLL Barbie???? Tifani found one in our catalog, but it has been sold. So it is a Floppy Eden lamb she is looking for. My daughter received this lamb as a gift from her great-grandmother and had it with her most of her life and along the way it went missing. We have looked at several websites and never knew the exact name of the lamb. We always called it “Lambers”. Anyways, my daughter is now pregnant and expecting her first child, which happens to be a little girl, and she is naming her Caden. We want so much to give Caden a “Lambers” and hope that with your help we can track one down. 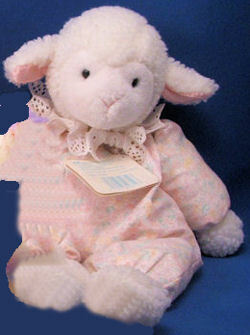 If you can help Tifani find this Eden White Floppy Lamb with Pink Print Body & Ruffled Collar, THIS SITE IS NO LONGER ACTIVELY MANAGED. Please use Our FREE FACEBOOK GROUP, including #100408-1 in the subject, .